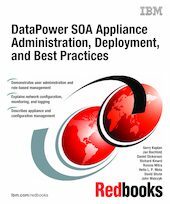 This IBM® Redbooks® publication focuses on operational and managerial aspects for DataPower® appliance deployments. DataPower appliances provide functionality that crosses both functional and organizational boundaries, which introduces unique management and operational challenges. For example, a DataPower appliance can provide network functionality, such as load balancing, and at the same time, provide enterprise service bus (ESB) capabilities, such as transformation and intelligent content-based routing. This IBM Redbooks publication provides guidance at both a general and technical level for individuals who are responsible for planning, installation, development, and deployment. It is not intended to be a "how-to" guide, but rather to help educate you about the various options and methodologies that apply to DataPower appliances. In addition, many chapters provide a list of suggestions.